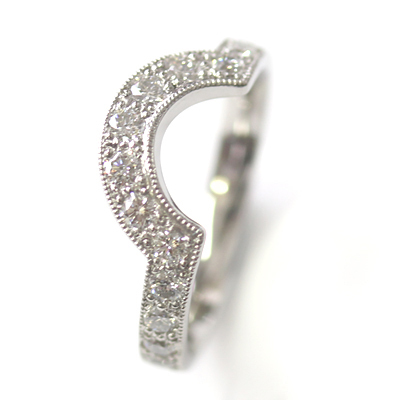 Platinum Diamond Fitted Wedding Ring with Millgrain Detail — Form Bespoke Jewellers Ltd.
A beautiful, platinum fitted wedding ring with diamonds and millgrain details. The couple came to us for a bespoke wedding ring that would sit alongside their cluster engagement ring. Often when an engagement ring has an unusual profile, it can be difficult to find a wedding band that fits neatly up against it. So, our expert jewellers create this bold and beautiful design that perfectly matched the two profiles together. Cast in platinum, the band was diamond set with a millgrain detail to complement the design of the engagement ring too.